Nearly 250,000 veterans and service members are each paying an average of $10,000 per academic year out-of-pocket while using the GI Bill to attend a public college or university because of the changes in their educational benefits regarding residency for tuition purposes, according to the Student Veterans Advocacy Group (SVAG). 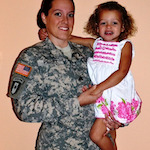 Hayleigh Perez has taken an active role in fighting for military veterans’ rights after experiencing frustration first-hand at being denied an in-state tuition rate. “Prior to this change, Veterans Affairs paid up to $17,500 in tuition per academic year, regardless of residency classification,” the report added. Hayleigh Perez was one of the students affected by the bill. 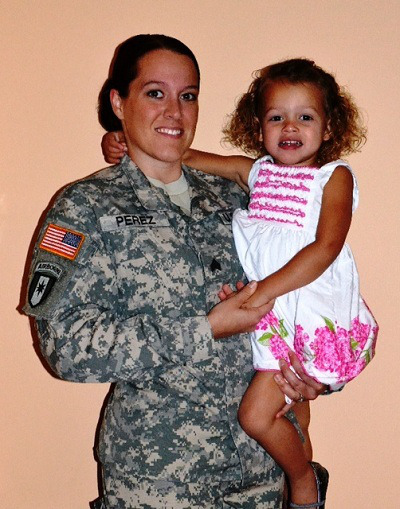 After an honorable discharge from the U.S. Army in September 2009, Perez decided to pursue her master’s degree. She and her husband, Sgt. 1st Class Jose Perez, who is currently on active duty, were relocated on a temporary recruiting assignment to Texas but they continued to pay property taxes for the home they had purchased in North Carolina. In the midst of moving back to North Carolina in November 2011, Perez applied to the University of North Carolina at Pembroke and Fayetteville State University in the UNC school system. Perez was accepted to both colleges but was only considered an in-state resident at Fayetteville State although she applied to both schools, meeting registration deadlines for the spring semester with the same documentation to prove in-state residency, which included a deed to her house, her voter registration information, her North Carolina driver’s license, and her husband’s orders. Pembroke still denied her appeal without explanation, according to Perez. After researching the subject matter, she came in contact with Thigpen at the SVAG and wanted to re-appeal with representation. Perez was not only denied the opportunity to re-appeal with representation but also greeted with “hostility and aggression,” said Thigpen. According to Perez, no one has reached out to her from the school to relay this information, but, even if they did, the problem would still be there. She explained that she does not want Pembroke to reconsider based on her husband’s active duty status but to consider her veteran status and to work toward consistent and fair standards for veterans across all the schools in the UNC system. Perez and Thigpen agree that the main problem in the UNC school system is consistency or the lack thereof for veterans’ support. Thigpen offered McDonald’s as an example. “If you went to McDonald’s in Florida and you went to it in Washington state and it didn’t taste the same, McDonald’s would have a problem, but McDonald’s even tastes the same in Iraq,” said Thigpen. As Perez and Thigpen continued their efforts to fight for other student veteran rights and set up a meeting with Kimrey Rhinehardt, vice president for Federal Relations and the primary liaison between the University of North Carolina and the federal government, they had other instances that angered them. “I have never seen such unprofessionalism as we saw yesterday,” said Thigpen. “You should have been there to witness her coming out the front door of the building as we were leaving.” Thigpen said that, despite a cast around her ankle and crutches, Rhinehardt came running out of the front door of the building with no crutches, yelling at them. As for presenting the petition, Perez said that she wasn’t given a chance to present anything. “She said that it was in our best interest to stop what we are doing and to back off and to work with them because we are only hurting ourselves and hurting our organizational endeavors by doing what we are doing,” Thigpen added. The next step for Perez and the SVAG is to schedule a meeting with the board of directors to further discuss the issue but currently no date has been set. As for the government’s reaction, although the U.S. Department of Veterans Affairs was aware of this specific issue, they said they were unable to discuss an individual case because of privacy regulations. Ed Kringer, director of the Office of State Liaison and Education Opportunity in the Department of Defense, also could not comment on the specific situation matter but offered insight on what the government is working on to make transitioning easier for service members and their families. According to Kringer, 15 to 17 states already offer a variation of this policy. For instance, on the Maryland ballot for this year is a referendum that includes the veterans’ issue, mentioning that voting “for” the measure extends the time in which honorably discharged veterans may qualify for in-state tuition rates. This act would extend the time period from one year after discharge to four years during which veterans could present documentation to qualify for in-state tuition at colleges if they can provide evidence of the required documentation. The required documentation includes evidence that the veteran attended a Maryland high school for at least three years and documentation that the veteran graduated from a high school in the state or received the equivalent of a high school diploma in the state. As for Perez, who is currently attending a private college, Methodist University, in Fayetteville, N.C., attending Pembroke is no longer a priority. Instead, she aims to make things easier on other veterans in similar situations by creating awareness of discrimination and telling her story. Thigpen agreed, stating that, although he isn’t personally affected by this situation, he takes it personally that his fellow veterans are affected.